TYRONE — Tyrone’s Ethan Vipond was named the most valuable player in boys tennis at the Mountain League Spring Sports Banquet Sunday night at Tyrone Area High School. Vipond was joined on the first team by teammate Paul Lemaire. Other area first-teamers were Huntingdon’s Bruce Perow, Soren Borgardt and Peter Kruse. n Huntingdon placed five players on the baseball first team — pitcher Jared Showalter, catcher Alex Mykut, second baseman Nick Zanic, shortstop Nick Holesa and outfielder Drew Weglarz. Other first-teamers included third basemen Keegan Soltis of Philipsburg-Osceola and Kevin Lehner of Tyrone. n First-teamers in softball included Central catcher Camryn Feathers and offensive pitcher Dylan Claycomb, and Philipsburg-Osceola infielder Hannah Thompson. 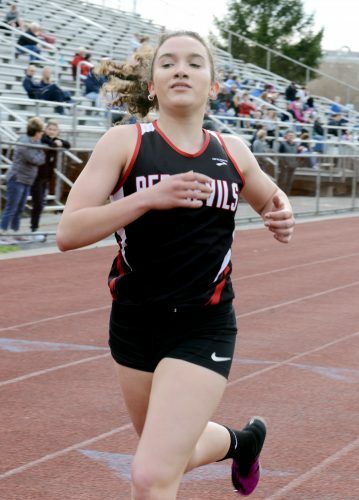 n Girls track and field first-teamers included Tyrone’s Emily Fusco (long jump and triple jump) and Tori Crabtree (800 run), Central’s Jocie Miller (javelin) and Huntingdon’s Gracie McKinney (pole vault) and the 400 relay team of Kylie Glorioso, Amanda Gwinn, Rachael Gwinn and Allie Troup. n Boys track and field first-teamers included Tyrone’s Parker Mitchell (100 dash and 200 dash), Jacob Meredith (high jump and long jump), Zach Kohler (1600 run), Joe Kohler (800 run) and the 400 relay team of Mitchell, Matt Clifton, Nick Vasbinder and Dan Parker. FIRST TEAM: Paul Lemaire, T; Bruce Perow, H; Soren Borgardt, H; Landan Rosinsky, C; Peter Kruse, H; Avery Rowles, C.
FIRST TEAM: Pitcher–Jared Showalter, H; Ashton Wetzler, B. Catcher–Alex Mykut, H. First base–Bobby Marsh, B; Second base–Nick Zanic, H. Shortstop–Nick Holesa, H. Third base–Keegan Soltis, PO; Kevin Lehner, T. Outfield–Trent Donley, BEA; CJ Funk, B; Drew Weglarz, H. DH–Eric Peggs, B. SECOND TEAM: Pitcher–Adam Armstrong, B; Ben Briggs, H. Catcher–Colton Burd, B; First base–Matthew Tobias, PV; Seth Bumbarger, CL. Second base–Nick Capparelle, B. Shortstop–Eli Glass, CL. Outfield–Matt Reese, BEA; Andrew Pearson, T; Cameron Shaffer, PV; Jared Showalter, H. DH–Landon McDonald, PO. FIRST TEAM: Outfield–Taylor Kerr, B; Mallorie Smith, B; Aspen Bishop, CL. Infield–Brooke Cline, CL; Alexis Wetzler, B; Hannah Thompson, PO. First base–Mackenzie McCloskey, BEA. Catcher–Camryn Feathers, CE. DP–Jordan Anderson, PV. Offensive pitcher–Dylan Claycomb, CE. Pitcher–Madison Peters, BEA. SECOND TEAM: Outfield–Ashley Negley, CE; Maddie Lucas, PO; Lacee Barnhart, BEA. Infield–Olivia Smith, CE; Lydia Collison, PV; Jenna Richey, CE. First base–Lissi Przybys, B. Catcher–Kylie Tha, PO. Offensive pitcher–Catherine Miller, H. Pitcher–Kamryn Harris, PO. FIRST TEAM: 4×800 relay–Clearfield (Jaclyn Freeman, Emily Shipley, Abby Laborde, Ashley Struble). 100 hurdles–Sydney Riegel, PV. 100 dash–Marissa Stecko, PV. 1600 run–Kelsey Hull, PV. 4×100 relay–Huntingdon (Kylie Glorioso, Amanda Gwinn, Rachel Gwinn, Allie Troup). 400 dash–Isabella Culver, PV. 300 hurdles–Katrina Spencer, CL. 800 run–Tori Crabtree, T. 200 dash–Isabella Culver, PV. 3200 run–Kelsey Hull, PV. 4×400 relay–Penns Valley (Jadyn Butler, Saige Corl, Isabella Culver, Sydney Riegel). High jump–Isabella Culver, PV. Long jump–Emily Fusco, T. Triple jump–Emily Fusco, T. Pole vault–Gracie McKinney, H. Javelin–Jocie Miller, CE. Shot put–Gabrielle Pighetti, B. Discus–Adazia Mellott, BEA. SECOND TEAM: 4×800 relay–Bellefonte (Amaya Rothrock, Amber Shirey, Katheryn Morgante, Abbye Schomer). 100 hurdles–Rachel Veneziano, BEA. 100 dash–Madison Jones, CL. 1600 run–Abby Laborde, CL. 4×100 relay–Clearfield (Madison Davis, Avry Grumblatt, Amanda Hazel, Madison Jones). 400 dash–Avry Grumblatt, CL. 300 hurdles–Sydney Riegel, PV. 800 run–Emma Lingenfelter, CE. 200 dash–Marissa Stecko, PV. 3200 run–Amber Shirey, B. 4×400 relay–Clearfield (Avry Grumblatt, Madison Jones, Amanda Hazel, Katrina Spencer). High jump–Marissa Stecko, PV. Long jump–Jadyn Butler, PV. Triple jump–Chesney Saltsgiver, T. Pole vault–Amanda Gwinn, H. Javelin–Madison Watkins, BEA. Shot put–Kylie Mitchell, CL. Discus–Gabrielle Pighetti, B. FIRST TEAM: 4×800 relay–Penns Valley (Mark Bierly, Brendan Colwell, Chris Colwell, Colton Sands). 110 hurdles–Pratan Steiner, CL. 100 dash–Parker Mitchell, T. 1600 run–Zach Kohler, T. 4×100 relay–Tyrone (Matt Clifton, Parker Mitchell, Nick Vasbinder, Dan Parker). 400 dash–Cole Hovis, B. 300 hurdles–Pratan Steiner, CL. 800 run–Joe Kohler, T. 200 dash–Parker Mitchell, T. 3200 run–Brendan Colwell, PV. 4×400 relay–Clearfield (Logan Firanski, Trevor Franek, JT Swales, Thad Butler). High jump–Jacob Meredith, T. Long jump-Jacob Meredith, T. Triple jump–Taye Lynch, CL. Pole vault–Andrew Hovis, B, Camden Knode, H, Nick Turner, BEA. Javelin–Grady Yarger, CL. Shot put–Luke Lambert, B. Discus–Luke Lambert, B. SECOND TEAM: 4×800 relay–Bellefonte (Daniel Methven, Austin Melius, Brett Pope, Cole Hovis). 110 hurdles–Nathan Walk, T. 100 dash–Tristan Klinefelter, PV. 1600 run–Colton Sands, PV. 4×100 relay–Clearfield (Trevor Franek, Taye Lynch, JT Swales, Isaac Rummery). 400 dash–Trevor Franek, CL. 300 hurdles–Spencer Graham, CL. 800 run–Colton Sands, PV. 200 dash–Judah Eveleth, BEA. 3200 run–Chris Colwell, PV. 4×400 relay–Bellefonte (Logan Von Gunden, Zachary Covone, Jackson Folnsbee, Cole Hovis). High jump–Dane Soltys, PO. Long jump–Moryelle Fernandez, B. Triple jump–Moryelle Fernandez, B. Pole vault–Jacob Taylor, T. Javelin–Jairus Werner, H. Shot put–Max kroell, B. Discus–Grady Yarger, CL.